Heritage farm animals are our passion. Enjoy your visit, we hope you contact us with any questions you may have. We always love to chat! 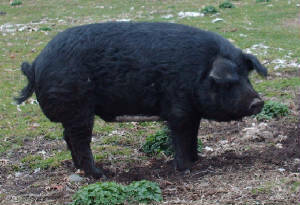 The American Mulefoot Hog is on the critical list of the American Livestock Breeds Conservancy (ALBC). One of the ALBC standards for inclusion on the critical list is having fewer than 200 registrations each year. Because of the limited availability of purebred stock, our primary purpose is to provide breeding stock to those interested in helping to increase the numbers of registered American Mulefoot Hogs. By involvement in this cause, we can take the Mulefoot from the perception of a curiosity to a viable widespread accepted breed. In turn, because of our primary purpose, at this time, we are not in the farrow to finish business to provide meat pigs for sale. 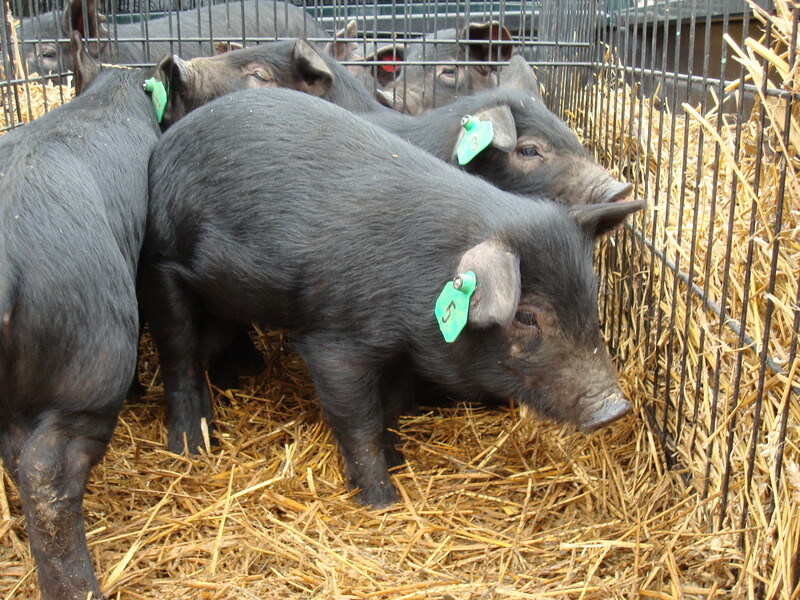 The few extra boar piglets we produce are available as barrows following each farrowing season. The thousands of crop and domestic animal breeds in the world today were brought into existence by the private efforts of farmers and herdsmen through the ages. Individual people following their private passions are still the best way to preserve these varieties for future generations. Animals favored by modern agribusiness aren’t those happy creatures featured in children’s books. 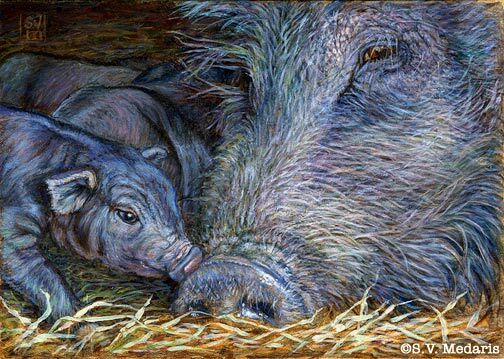 They’re bred to emphasize marketable features: cows that deliver rivers of milk, for example, and pigs that produce uniformly large, low-fat pork chops. Other characteristics, such as resistance to disease or tolerance for heat, have been downplayed, because farmers can compensate with advanced care techniques and medicine. "Through better animal health, through better medicine and better control of the environment, we in a way obviated the need to breed these animals for hardiness in resisting negative environmental influences, including disease,". "We have created a very delicate animal." Some 27 American farm breeds have become extinct since the early part of the century. Most of the rest are declining in numbers. Each time one goes, it takes with it a configuration of genes that took millennia to create. Genes for tallness, shortness, fat or lean meat; for disease resistance, fertility, climate tolerance. In some scientific circles, "genetic erosion," as it's called, is considered one of the biggest threats to humanity's future on the planet. But not many people are familiar with the notion, and no one is doing much of anything about it. Join us in preservering our precious heritage! 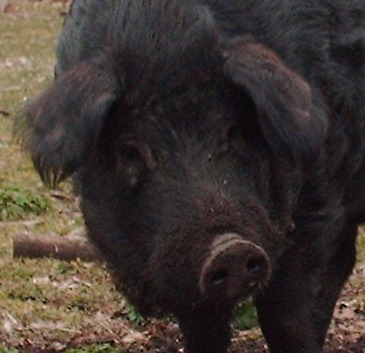 One of our boars-fabulous coat! What is a "heritage" farm animal? "These animals represent the work of generations of farmers. They are part of our heritage, a cultural artifact just as much as a piece of music, a painting, a dance performance. And they should be preserved with the same care and attention." The American Livestock Breeds Conservancy is a clearing-house for information on livestock and genetic diversity. These breeds are threatened because agriculture has changed. Modern food production now favors the use of a few highly specialized breeds selected for maximum output in a controlled environment. Many traditional livestock breeds have lost popularity and are threatened with extinction. These traditional breeds are an essential part of the American agricultural inheritance. Not only do they evoke our past, they are also an important resource for our future. To request further information fill out form below. For the time being we are not taking reservations. Free Website Promotion to 500+ Search Engines. Submit Now!